Below is a chart showing the winner of each Maher Cup match through time. Where there was a draw it has been coded for the holder. People often tell me that things were simpler in the old days. Less red tape. We just got on with it lad. Hmmm but not aways. In Maher Cup Country, when footballing matters mattered things could get quite bogged down. People could be a little pernickety. The Grenfell Greens had not achieved much in Maher Cup football. Until 1938 their challenges had been limited to just four – all lost, with just 13 points earned and 80 conceded. Which games attracted the biggest crowds? Let’s make a top ten list. 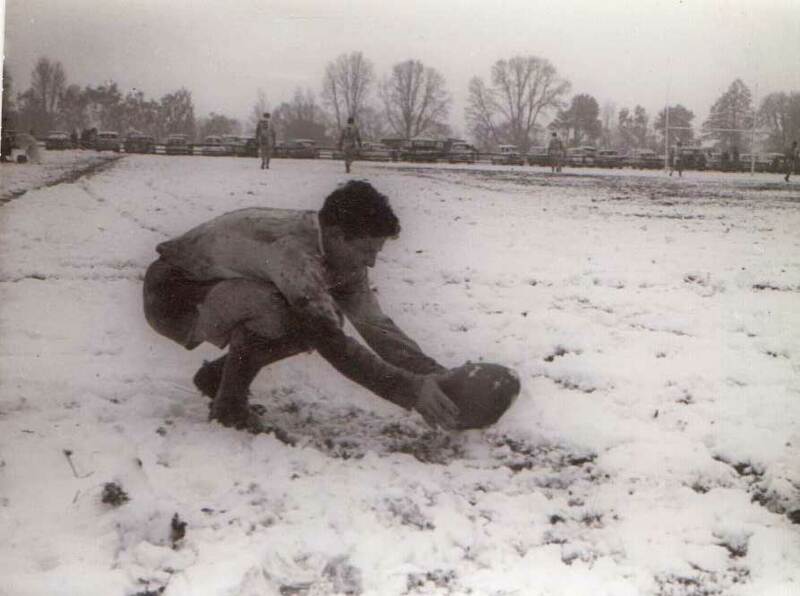 Roddy Gilmore, farmer of Canowindra, was a pretty useful second rower. He worked a 600 acre soldier settler’s block, carved from the North Bangaroo Estate in 1924. It was said that he “cut off the legs of his working trousers to make his football shorts for his first game (Worboys, p22). This is the first in a series. “And the rain it gently, pattered down! And the lovely green flats of the ‘Bidgiee silhoutted, as it were, against the sky line as the special train from Tumut, with footballers and supporters aboard steamed over the railway bridge yesterday afternoon. The footballers’ quest was the Maher Cup — they were going to capture it for Tumut— so they said. And their supporters were going to stir them on to deeds of derring do”. (The Gundagai Independent, 7 June 1923). Although Tumut is both the place of origin and place of rest for the Cup, Cootamundra was the heart of Maher Cup football. As you can see below Cootamundra was clearly the dominant side. It was also the geographical and administrative centre of Maher Cup and Group 9 Football.